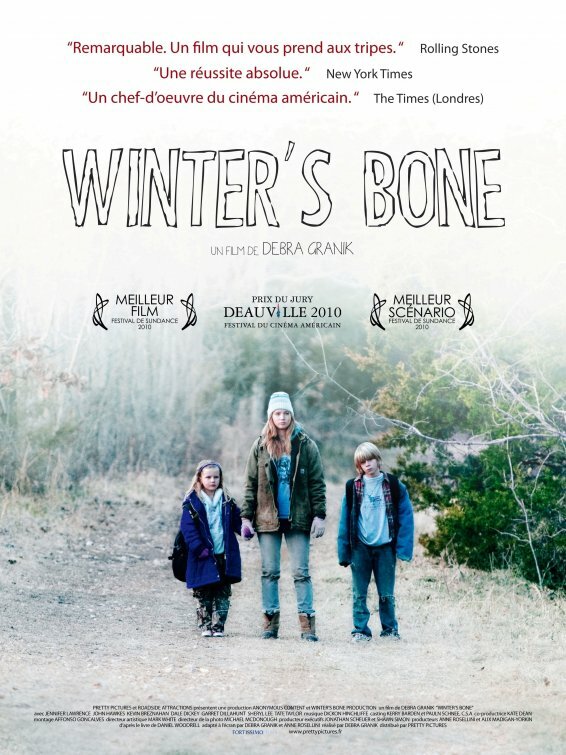 From The Archives: WINTER’S BONE (2010). You do NOT want to go swimming in this lake. Here’s a piece I originally wrote on July 12th, 2010. Enjoy! I’m automatically endeared to a movie that creates a believable environment. I like a movie that takes me places I’ve never personally been – even if they’re places which I don’t really want to go. 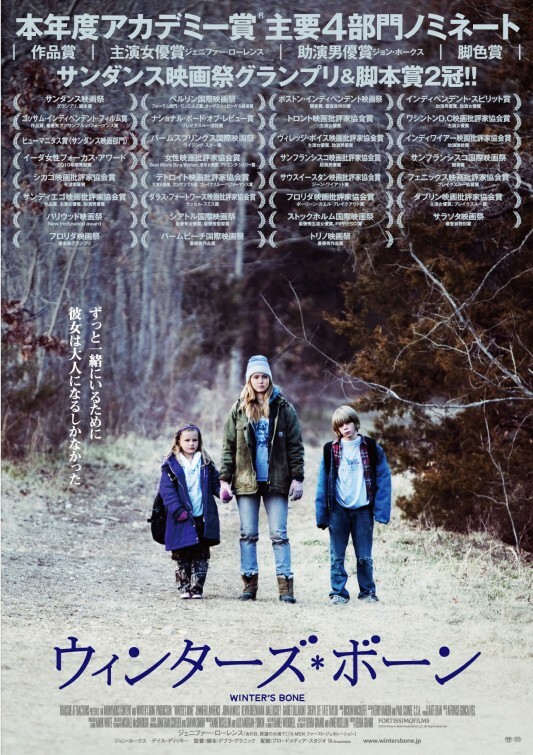 Winter’s Bone is that kind of a movie. It drops you directly into Missouri’s stark and distinctly rural Ozark Mountains, without a road map or a tour guide. The closest we get as far as a character we can relate to is the young protagonist, Ree Dolly. She’s a tough kid, by necessity, as her mom is just this side of catatonic and her dad skipped out on meth dealing charges, leaving Ree with a younger brother and sister to watch over. Ree has dreams of getting out by joining the military, but even those dreams are probably solely oriented around money. She hasn’t really considered the reality of what a military commitment entails, and probably wouldn’t even know what it would. She just needs to find a way to keep the family house, and to keep those two little kids from being separated. That becomes a very real threat once the town sheriff (the great character actor Garrett Dillahunt from No Country For Old Men, The Road, and TV’s Life) notifies Ree that her dad put up their house as bail, and if he isn’t found, they will be evicted. Ree is played by Jennifer Lawrence, who resembles a young Renee Zellweger, if Renee Zellweger hadn’t been making that scrunched-up face for the past fifteen years. It’s a fair comparison, because Renee Zellweger in her first few movies had that accessible quality and the kind of lovability that makes you want to look after her. 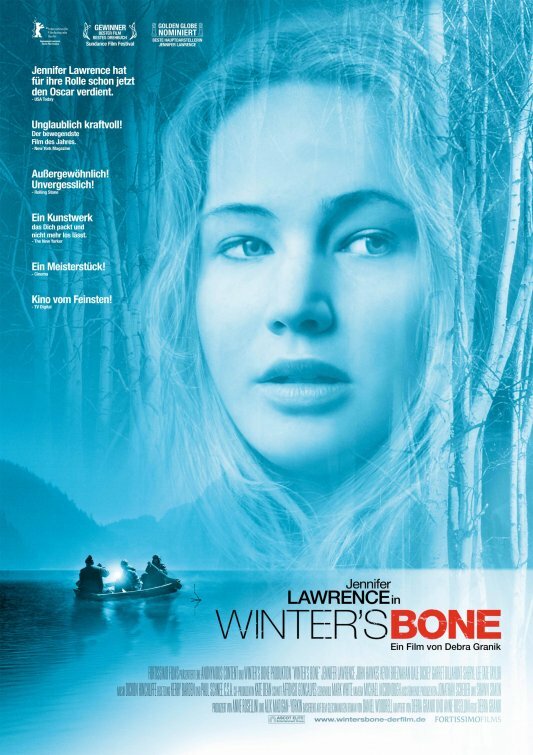 That’s a quality that Jennifer Lawrence has here in abundance, and that’s what makes Winter’s Bone such a wrenching view, because Ree is in deep, deep danger throughout most of the movie. I’ve heard Winter’s Bone referred to as a noir film in country clothing, and to a certain extent that’s true. 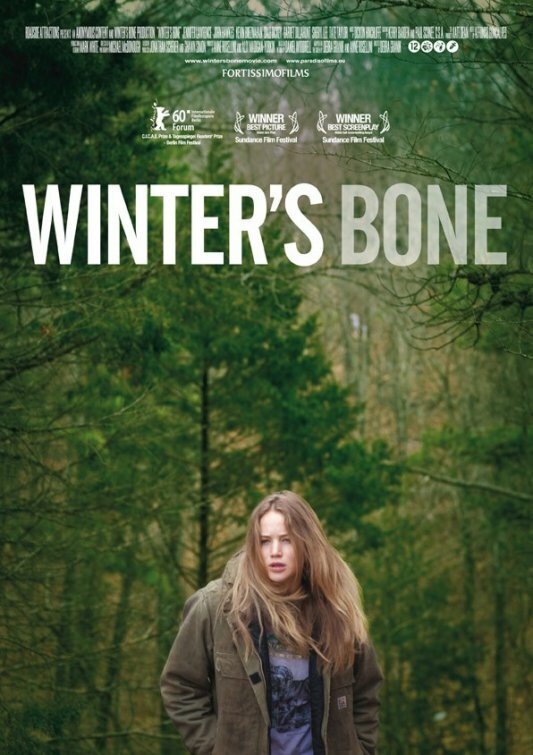 Winter’s Bone very intriguingly covers some typical noir terrain in its plotting, but in an almost documentary-style way of filming that feels more genuine, and less like a typical movie, let alone a strict genre movie. The separation comes in the character of Ree, who unlike a true noir protagonist, seems to be incorruptible. She’s never tempted, never wavers, never considers giving up.on her quest to find her dad – not even when she begins to suspect that he may be dead, not even when she takes the classical noir-hero beating, not even amidst all kinds of obvious mortal peril. That’s why, even more than noir, Winter’s Bone reminds me of a dark, dark fairy tale such as Snow White, or even the myth of Orpheus. Yes, this movie invites such high-falutin’ referencing, because it’s just that good. But please know that Winter’s Bone is a lot more entertaining and compelling than its universal critical acclaim and my own jawing tends to suggest. It’s a real edge-of-your-seater, which you don’t realize at first but once the suspense sneaks up on you, it’s of the unbearable variety. Ree’s quest really just consists of episodic visits to her relatives (by function of geography, nearly everybody in this movie seems to be relations) – although blood doesn’t mean the same to some of these people and if this little girl keeps asking the wrong questions, many of them seem well willing to make her disappear along with her dad. One of the scarier characters she encounters, although surely the most compelling, is her dad’s brother, known only as Teardrop. This is a guy who has no reservations about indulging his drug habit in front of his niece, who has no apparent fear of man nor law, and who seems about a hummingbird’s nose hair away from committing an act of violence in any direction. Instead of casting some gargantuan monster man, Winter’s Bone had the great sense to cast the reedy, scrappy, ingratiating character actor John Hawkes (from Miami Vice, The Perfect Storm, TV’s Deadwood and Eastbound & Down). John Hawkes is one of those actors you always recognize and are happy to see, but before now he probably wasn’t anybody’s first choice to play a horrifying tough guy who puts the fear of the Devil into cops and crooks alike. Turns out he was perfect casting. This is one of those portrayals they call “haunting” – if you have the good sense to check out Winter’s Bone, you will remember you saw it. That’s because of John Hawkes, and the way he works with the aforementioned Jennifer Lawrence. He’s her uncle, yeah, but you’re never sure that he won’t snap and pop her head off like a dirty-blond dandelion, not even after he relents to conscience or duty and helps her out on her quest. There’s no sentimentality here, and not really any sentiment either. It’s never entirely clear why Teardrop decides to help Ree, and that’s what makes the movie so interesting. 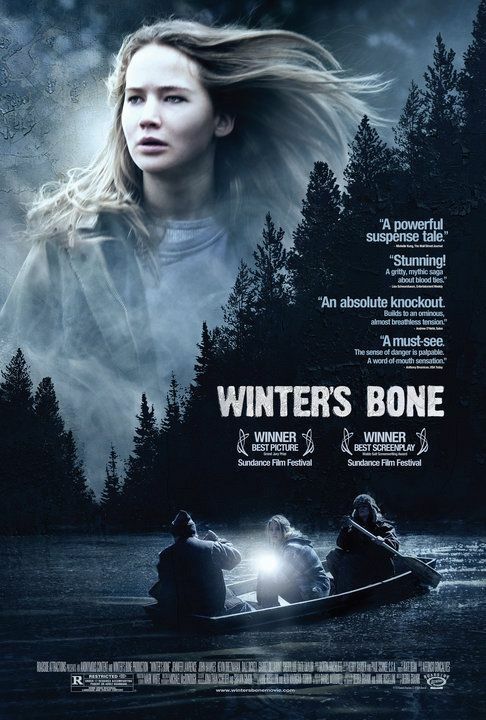 The other fascinating thing about Winter’s Bone, as I started out this review by referencing, is the sense of a real, living environment that it creates. The Ozarks, as shown here, feel real and tangible. The people, both the good and the bad (and to be honest, the ugly) all seem like people you could meet if you knew how to get there. Incredibly, the movie passes no judgement. Nobody feels like a caricature, a stereotype, a prejudice. Even the bad guys are just trying to protect the world they inhabit. We may not agree with their decisions, but we’re not prodded to judge either. 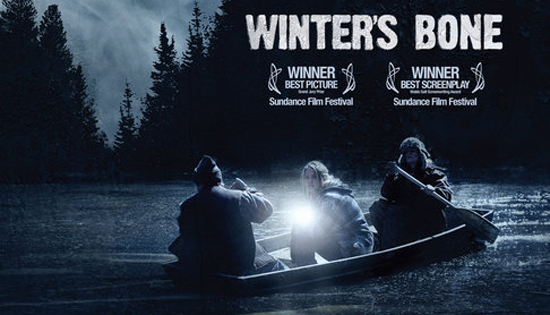 Winter’s Bone simply presents the locations and characters, and lets the audience discover their virtues, weaknesses, and intentions as the story progresses. It’s really a creditable achievement on the part of co-writers Debra Granik and Anne Rosellini (working from the novel by Daniel Woodrell), and the masterful command of tone and atmosphere on the part of Debra Granik as director. They make a genre exercise feel fresh; they make a feature feel like documentary. This is obviously one of the best movies of the year. 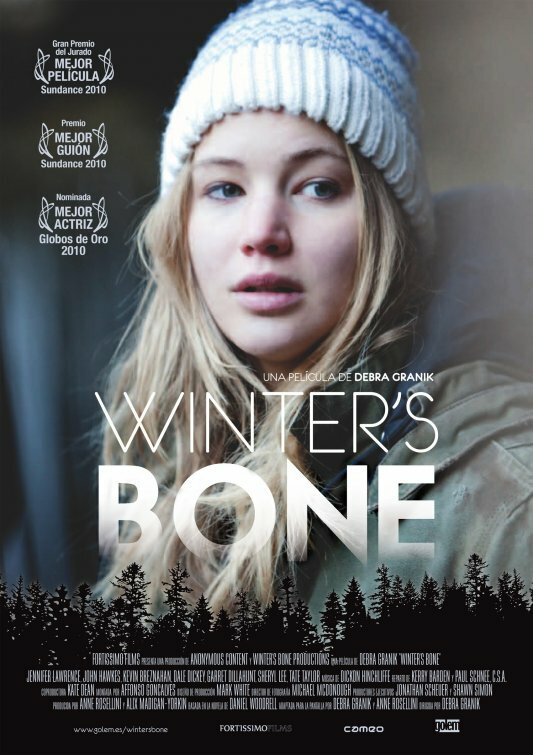 If you’re one of those people who has been complaining about the lack of good movies being released this summer, seek out Winter’s Bone and watch how quickly you’ll stop complaining.